Have you liked too many pages on Facebook? When you enter Facebook sweepstakes, you might end up "liking" a lot of pages. Even sweepstakes that aren't hosted on Facebook will often give you bonus entries for following the sponsor's pages. Not to mention pages that you might have liked to get news about discounts or special offers. The number of pages you follow can add up quickly. But there is a limit to the number of pages Facebook allows each person to like. As of this writing, the limit is set at 5,000. That number sounds like a lot, but over years of entering Facebook sweepstakes, you may find that it's not enough. Liking too many pages makes it harder to see updates from friends, family, and companies you really want to keep up with on your timeline. Plus, Facebook ads allow companies to target their audience based on what they have liked, so those pages could influence the ads you are shown. So what do you do if you are getting close to the limit or if you just want to clean up the pages you've liked on Facebook? You'll have to make room by unliking some of those pages. If you are browsing your timeline and come across a post from a company that you no longer wish to follow, unliking the page is simple. Just hover your mouse over the company's name at the top of the post. A box will pop up with some information about the company. At the bottom, you'll see buttons that show that you have liked and/or followed the page. Just click on them to uncheck them and the company will no longer appear in your timeline. Simple, done. But if you are dealing with removing a significant number of outdated or uninteresting pages, doing it one page at a time will be tedious and time-consuming. Luckily, there's a trick that makes it easier to remove many Facebook pages at a time. Log into your Facebook account and click on your name at the top right-hand side of the page, next to "Home". Click on the "Activity Log" button. (A shortcut to go directly to the Activity Log page is by copy-pasting this URL into your browser window: http://www.facebook.com/YOUR-FB-NAME/allactivity. Substitute your actual Facebook name for YOUR-FB-NAME). On the left-hand side of the screen, select the link for "Likes and Reactions" and then select "Pages and Interests". This displays a handy list of all of the pages you currently have liked. Each page listed has a little pencil symbol on the right-hand side of the screen. Clicking the pencil gives you several options, including "Hidden from Timeline" and "Unlike". You can choose "Hidden from Timeline" if you want to continue to follow the page, but you don't want to see updates from the page mixed in with your other friends' updates on your timeline. Choose "Unlike" if you want to stop following the page (this is the option you'll need to choose if you are approaching the limit of the number of pages you are allowed to have "liked". Work your way down the list, removing pages you no longer need. Voila! If you are not sure what a page is about or whether you still want to follow it, right-click on the page's name and choose the option "open link in new tab" or "open link in new window" to open the page without losing your place in the list. Make sure you really want to unlike the page. Many sweepstakes sponsors run giveaways on a regular basis. Having their posts appear in your timeline is a quick and easy way to find out when they are giving away more prizes. In some cases, you might want to simply stop the page from appearing on your Facebook news feed. 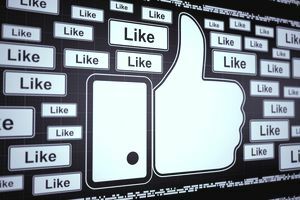 It's a good idea to go through your Facebook likes on a regular basis to make sure that you don't have too many pages clogging up your account. It's much easier to stay on top of your likes if you don't have to do it all in a rush because you've bumped up against the limit. Reviewing the pages you have liked on a regular schedule, such as once a month, makes the job more manageable. It's easier to remember why you liked a page if you are checking it regularly and it won't take so much time to go your the list. It also allows you to quickly catch any changes, such as pages that are no longer active and are therefore pointless to follow. It's a good idea to review your Facebook apps on a regular basis as well. If you no longer need the app, there's no reason to continue to give it permission to access your page or your personal information. Reviewing your app permissions helps keep your account safe and secure.